An exciting new compact SUV is coming to Van Isle Ford, called the 2018 Ford EcoSport. It will be the smallest SUV from the brand, making it practical for anyone who finds the Ford Escape to be too large. At the same time, this new model is fun to drive, plus comes loaded with utilitarian features designed to accommodate your daily tasks. Most SUVs don't perform great when it comes to handling. That's where the Ford EcoSport really shines. Thanks to its small size, plus a well-tuned chassis, you'll love navigating through even the tightest of areas. Helping you to surge ahead is a 1.0-litre EcoBoost engine. It uses a turbocharger, plus direct injection to create plenty of power, but without weighing the SUV down. You'll appreciate the innovative design each time you press down on the accelerator to pass on the highway, or get up to speed on any road. Optimizing fuel efficiency further, a start-stop system automatically shuts off the engine when you're not moving. Once you remove your foot from the brake pedal, the engine starts up again, so you're ready to go. Thanks to the available intelligent four-wheel drive, you can handle Canadian winter conditions. The system automatically sends power to where you need it most, especially when the roads become treacherous. 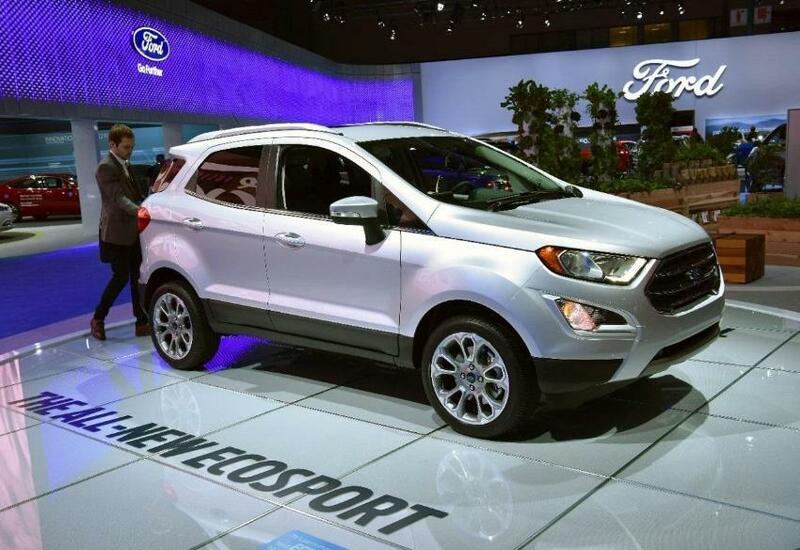 Even the exterior design of the Ford EcoSport helps boost performance. Aerodynamic parts allow the SUV to cut through the air, so you consume less fuel and need to press on the accelerator less often. Wherever the Ford EcoSport takes you, advanced technologies make the ride more enjoyable. These features address your many needs while on the go, so you'll wonder how you managed before getting this compact SUV. You need to be safe while on the road. Several technologies take a proactive approach, so you'll know when threats loom. One is blindspot monitoring, which also features rear cross-traffic alert. The system uses radar sensors to detect other vehicles you cannot see otherwise, so you avoid accidents. Adding Sync 3 means you have an infotainment centre that reacts quickly to your commands. The 8-inch touchscreen works with tapping, pinching, and swiping, just like your smartphone. You also enjoy voice commands that work with natural speech, instead of needing to learn strict phrasing. Everyone will love riding in your Ford EcoSport, no matter if they sit in the front or rear seats. You'll be comfortable driving, so you'll always look forward to any trip. When the weather turns cold, you'll be ready. An available heated steering wheel means you can drive without wearing gloves, and keep your hands warm. Optional front seat heaters help, too. You can also get a windshield wiper de-icer, making it easier than ever to clear snow, ice, etc. off the glass. Adding the optional Bang & Olufsen HD sound system makes for great mobile entertainment. The system features 9 speakers, so you get plenty of audio clarity. Come check out the new 2018 Ford EcoSport and learn more about its exciting features, just by visiting our showroom at Van Isle Ford.